BRICKFORM Antique-It is a water soluble antiquing agent designed to impart a secondary color or highlight over stamped concrete or textured overlays. Antique-It is easy to apply, dries fast and provides a durable color that closely resembles the look of release powder. Brickform Antique-It is a water soluble, surface-applied antiquing agent that refreshes or mimics traditional release agent. It is applied with a brush to textured or stamped concrete and overlays, dries quickly, and imparts a durable secondary color. Antique-It is especially useful in restoring the appearance of older concrete surfaces by adding additional color and highlighting texture. Antique-It is a fast, easy, and economical means of upgrading a slab’s appearance. It is perfect for nearly any surface, including driveways, sidewalks, patios, and interior floors. This Brickform distributor in Akron, Ohio updated their shop using Brickform Stampable Overlay and SM Professional. The wood-grain surface is Stampable Overlay with the Classic Wood texture. The color effects can be achieved using Brickform Liquid Overlay Colorant, Color Hardener, or your choice of Stain for the base color. The highlight color can be created using Antique-It, Antique Release, or your choice of Stain. The tile pattern is SM Professional, colored with Liquid Overlay Colorant. The highlighting and foreground color can be created using your choice of Stain. In this video, we show you how to bring new life to an old stamped concrete driveway. Badly in need of repair and restoration, watch our expert return color to the surface of the concrete. Brickform Antique-It is a topically applied, water-based color perfect for restoring old textured surfaces, as well as giving an aged antique appearance to new surfaces. 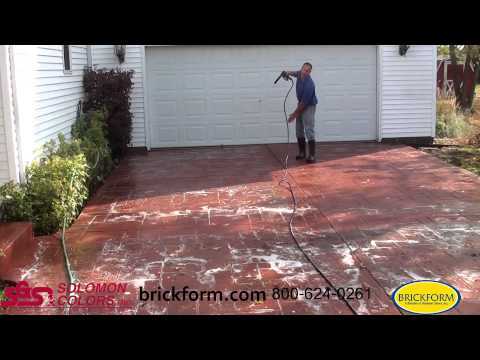 In this video, a 15 year old stamped concrete driveway is profiled using Brickform E-Etch and Neutra Clean. The driveway is then colored with Antique-It and sealed with Poly-Seal 400. The Brickform 40 Standard Colors are available in Color Hardener, Antique Release, Antique-It, Cem-Coat, FreestylePro, Overlay Liquid Colorant, and Tinta' Seal. Disclaimer: This digital color card should be used as a general guide, not a definitive indicator of final color. Shades and hues can vary depending on screen settings. When planning a project, consult a physical color card for a better indication of potential color. Create a representative mockup before any project to better account for the effects of conditions, material, and techniques that may alter the final appearance or color.